I have taken several seminars on lighting and I always leave inspired. That is, until I start trying to recreate the effect and know that I am missing something. If I could just see it one more time to nail it down. That’s what makes Scott Kelby’s new book/DVD so special. 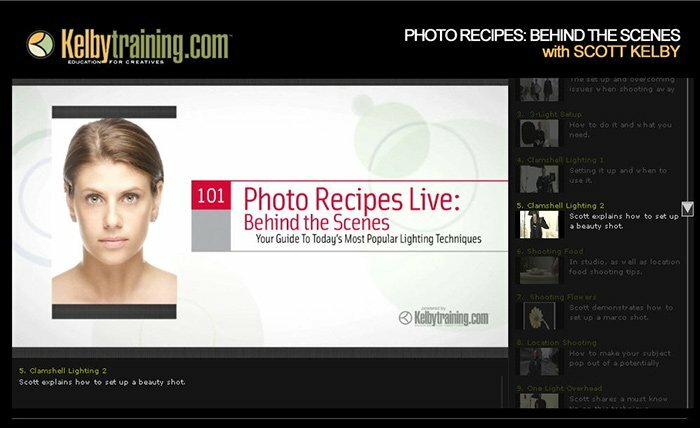 Scott Kelby’s Photo Recipes Live : Behind the Scenes takes the most popular “photo recipes” from his three Digital Photography Books and reproduces them “live” on the DVD. Kelby shows you step-by-step on recreating each effect directly out of his books and shows you how to solve the problems that will likely pop-up. Window Light Portraits (natural light). The entire DVD runs 2-hours and is supplemented with a print reference guide. The topics are covered in a fresh tutorial, much like Kelby’s Photoshop tutorials on kelbytraining.com. Overall, the DVD layout and print guide make it a great reference and idea guide. ← Previous Previous post: B&H Photo may be Closed, but Adorama Customer Service is Open!